The President, Mr. J.A. 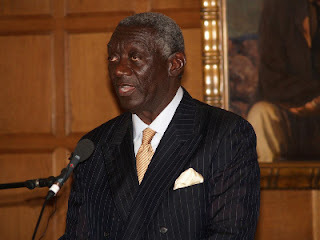 Kufour has acknowledged that his leadership as the Chief Executive of the Republic of Ghana has been tough and challenging.He said for the past seven years, he has led a government that has ensured a holistic national development, thus making his experience as the President fulfilling as well as sobering. President Kufuor was speaking at the inaugural lecture of the Association of Black Rhodes Scholars at the Oxford University in UK, last Monday.The Black Rhodes Scholars Association was formed primarily to encourage brilliant but Black needy students who are not privilege to be enrolled in universities and also to ensure effective representation of black student at Rhodes.Members of the association are drawn from the US and Canada as well as from all former British colonies. Oxford University enrolled its first black student 900 years after its establishment and even today, as the oldest English University and in deed one of the oldest in the world, has only one percent of its entire student population as black.The inaugural address by President Kufour also marked this year’s black history month as well as Ghana’s 50 independence anniversary at the university.The Rhodes House, the venue of the lecture which is the first in the series of lectures planned by the association, was filled to capacity long before the schedule time but the blacks were very few. President Kufour noted that in a month’s time he will be entering the final year of his rule and the legacy he will want to leave behind for the youth of Ghana and Africa in general will for them to seize the opportunities of global system to secure a dignified position for the continent.He said, as he left the walls of Oxford University some fifty years ago “there was no certainty of becoming the President of Ghana”, but by dint of hard work and unwavering focus he today finds himself as the President of Ghana, The Chairman of the African Union and two-term Chair of the ECOWAS. He said he has used a blended values of his family background, the culture of Ghana as well as the faithful application of educational precepts and influences of the various institutions he attended especially Oxford university. He also mentioned the traditions of the New Patriotic Party as very useful to him.He mentioned some of his government’s achievements as the turning around of the nation’s stagnant economy by attaining a record and steady GDP growth rate of 6.5 percent currently as against 3.2 per cent in the year 2002. President Kufour predicted that all being equal Ghana’s GDP growth rate will be at 10 percent within the next four years especially at a time Ghana has discovered off-shore oil.He also touched on the improvement and expansion in the health, educational and agricultural sectors adding that production of the country’s main cash crop, cocoa, hit 700 thousand tones and expressed the optimism that cocoa production in Ghana will hit one million tones by 2010.